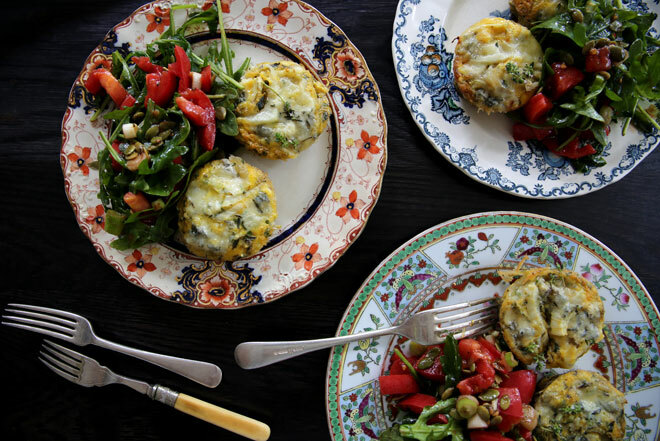 These divine little fennel, thyme and gorgonzola cheese quiches. I love the subtle and fresh aniseed flavor from the fennel, the subtle earthiness from the thyme, heavenly paired with the sharpness of the gorgonzola cheese. If you are not a fan of blue cheese, you could always use feta instead which also tastes wonderful. What I love the most about these mini quiches is that they are so simple to prepare, yet are still a little fancy, wonderful to make if you have guests coming around for Sunday lunch. Preheat the oven to 180 C, and grease 6 muffin tins with butter or olive oil. In a large bowl, add the eggs, fennel, spring onions, thyme, and a pinch of sea salt and ground pepper. Mix well, and divide between muffin tins. Top with the cheese, and then place in the oven to bake. Bake for 20-25 minutes, or until cooked through and lightly golden on top.